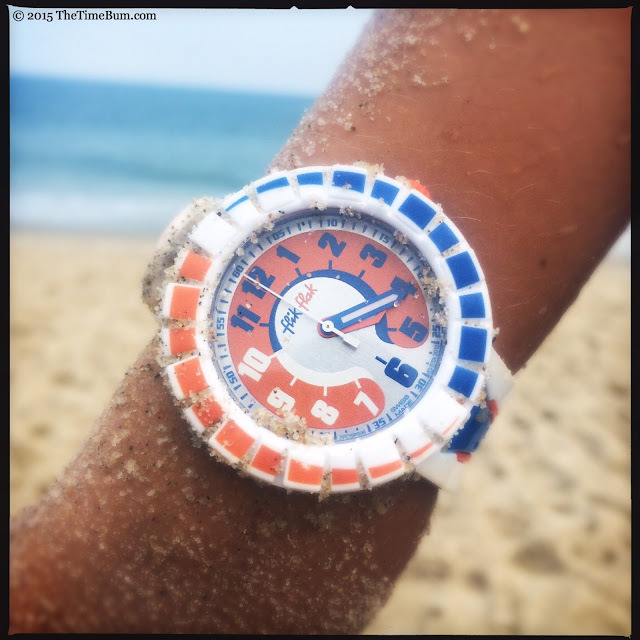 Today, The Time Bum brings you the perfect back-to-school watch post with a review of the Swatch Flik Flak. 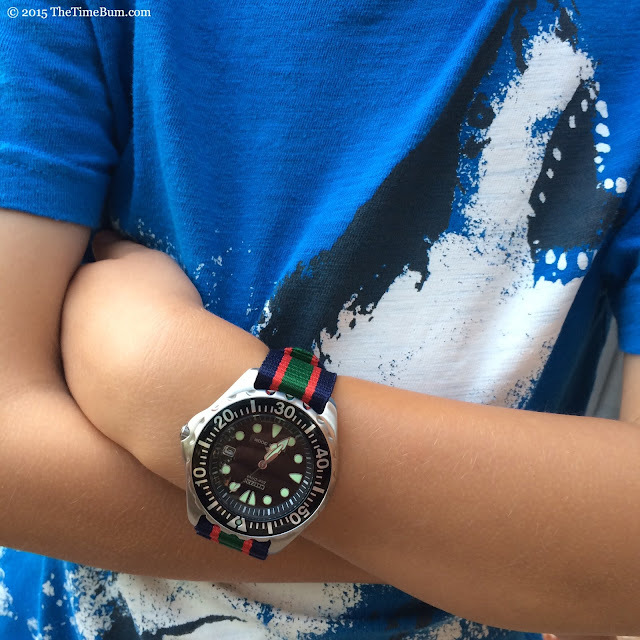 Why am I reviewing a kid's watch? Because it belongs to my son, Bum Jr. and I can't have a watch in my house for long without reviewing it. Why does he have this particular watch? I thought you'd never ask! Let me tell you a cute story about my kid. I promise there is a review in here too. Bum Jr. was about to enter First Grade, and he had no interest in telling time. Of course, he was perfectly capable of learning, he just didn't care to try. Even getting him to read the digital display on the cable box was a big deal, involving much complaining, huffing, and rolling of eyes. It was driving his Time Bum father crazy - until he discovered my watch collection. He started by asking me about the watches I was wearing and helping me pick which one to wear in the morning. Bum Jr. has no shortage of opinions, particularly on sartorial matters, so he was delighted to identify his favorites. 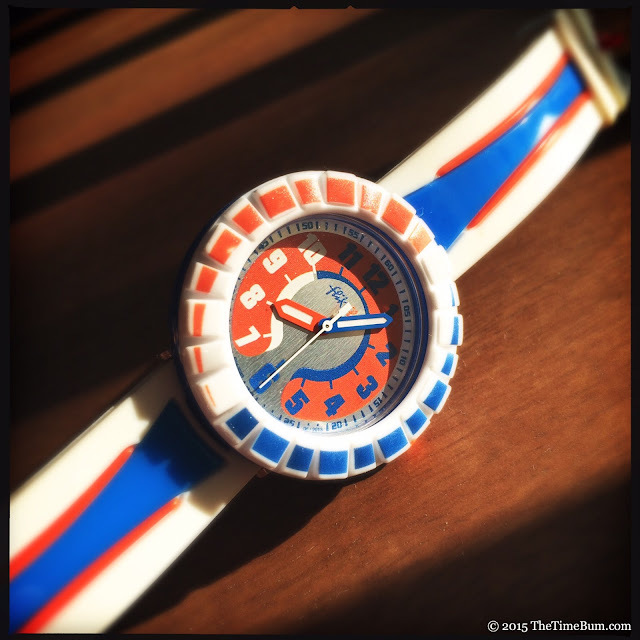 The red dial Lew & Huey Orthos was an instant hit, as was the Bullseye Timex. The black dial divers were immediately dismissed as "boring" until I flipped on a UV light and showed him what SuperLuminova could do. I let him try them on showed him how to use their various functions. He soon asked for one of his own. At last, motivation! Mrs. Time Bum and I struck a deal with him; the minute he learned how to tell time, we would get him his first watch. We bought some flash cards and after a couple of days, he was getting the hang of it. By the end of the week he had it down. That Saturday, I let him wear one of my watches (a 40mm Citizen Promaster on a nylon strap) on the condition that he would submit to random time-telling quizzes throughout the day. He agreed and passed with flying colors. It was time. Bum Jr. rocking the Promaster. Not too shabby. Like any good watch nerd, Bum Jr. had some strict criteria. 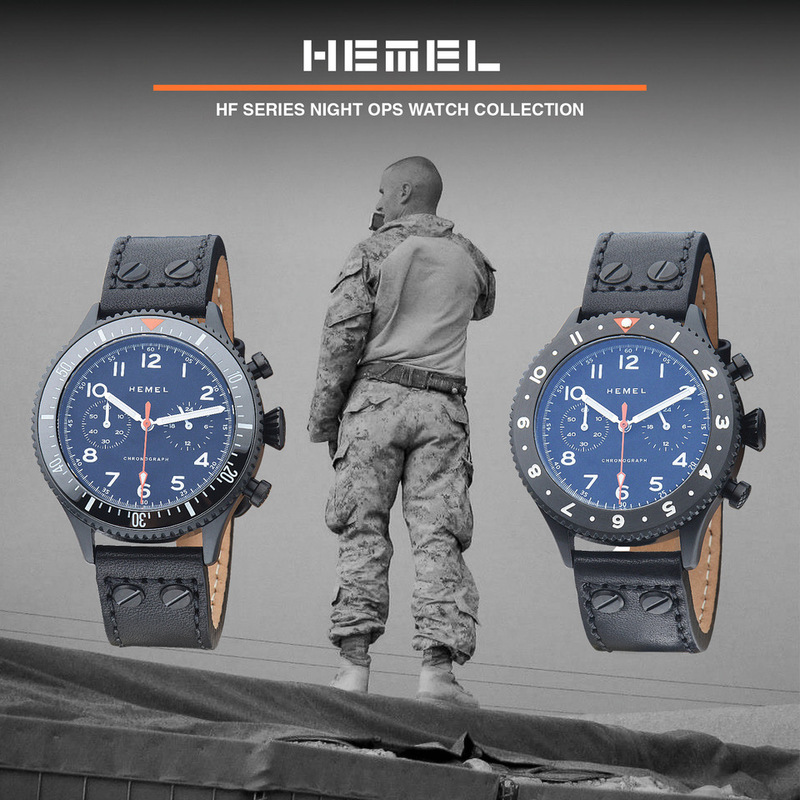 "First of all," he said, "it has to be a real watch, not one that just has numbers." No digitals, that's my boy. He liked bright colors, but he absolutely did not want a watch "with stuff on it." He explained, "Lots of kid's watches have cartoons or pictures on them like Micky Mouse. I don't want one of those." I could respect that although it dashed my hopes of passing down my cherished Snoopy Timex. "It also has to be waterproof so I can wear it in the pool and I need it to glow so I can tell time at night" he concluded. All in all, these were pretty sensible choices. We went back to my collection so he could show me what kind of watch he wanted and try some on for size. 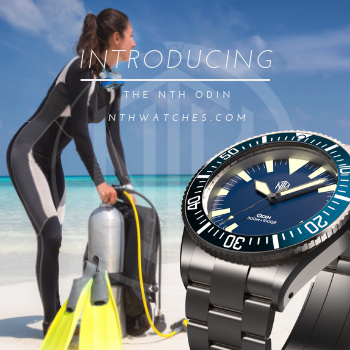 He zeroed in on a watch that did everything he required; the Deep Blue Sea Ram. It took some effort to convince him that was too big, even after I strapped it to his tiny wrist and demonstrated that the 45mm, orange-on-white monster overlapped his arm and weighed enough to tip him over. The Sea Ram experiment. Too much? He finally agreed that the 34mm HMTs were more his size but were not his style. I briefly considered buying him the ladies' Sea Ramic, a 36mm version of the beast he liked so much, but at $299, that seemed like overkill. 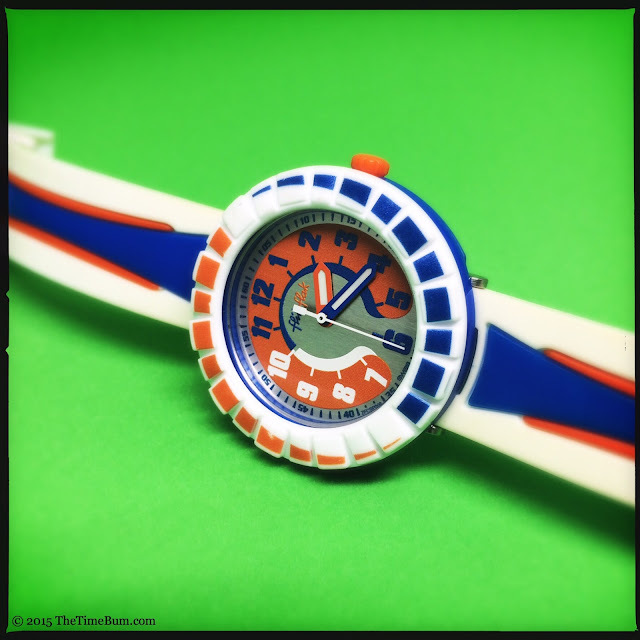 Mrs. Time Bum suggested a trip to the Swatch store instead and he selected the $55 All Around Blue & Orange model pictured here. 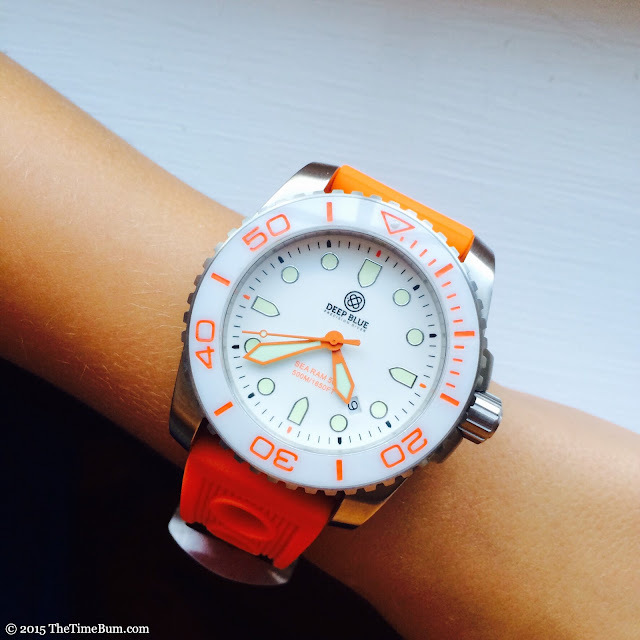 This model is NLA in the US but can be purchased from Swatch UK. Nobody ever said kids make it easy. Like most Swatches, the Flik Flak uses a Swiss quartz movement in a plastic case. In fact, every exposed part of the watch is plastic: case, bezel, crystal, even the crown. A screw-in battery is mounted on the outside of the case back and can be easily replaced by the owner at home, or for free at any Swatch store. The watch measures just 35 across the bezel (excluding crown) and just over 10mm thick, which is a good fit for little wrists while still being fashionably chunky. It is downright huge compared to the 25mm timepiece I had at his age. Alas, times have changed. This model has a rubbery plastic strap that attaches to the case with a pair of steel pins, but fabric straps are also available. It is pretty sharp looking if I do say so myself, with racy blue and orange stripes on a white background and a white buckle with an orange tang (a designer's joke?). It was also a source of incredible frustration as Bum Jr. struggled to operate it. Buckling a watch strap is something we adults take for granted but I soon realized that there is a specific technique that must be learned. He had no trouble strapping on one of my nylon NATOs, but this was maddening as the stiffness of the strap made it difficult to push the long tail through the buckle without the tang popping free. With a few days practice and some breaking in, he was able to do it himself but a fabric strap would have been far easier. 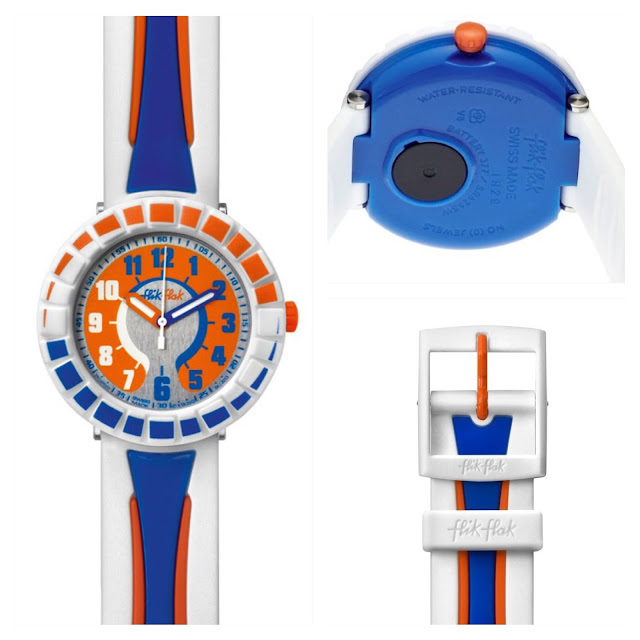 The All Around Blue & Orange looks like a dive watch built by Fisher-Price. The white bezel cheerfully bears the colors of its name a sort of 1970's strobe pattern, but it has as limited utility. "There are no numbers," Bum Jr. observed, "I like that I can turn it, but I can't really time anything." His solution? "I just turn it so one day the blue is up and the next day is orange." He also had no trouble operating the crown to set the time. It was far more of an effort convincing him not to reset it every time he passed a clock that was a minute off. 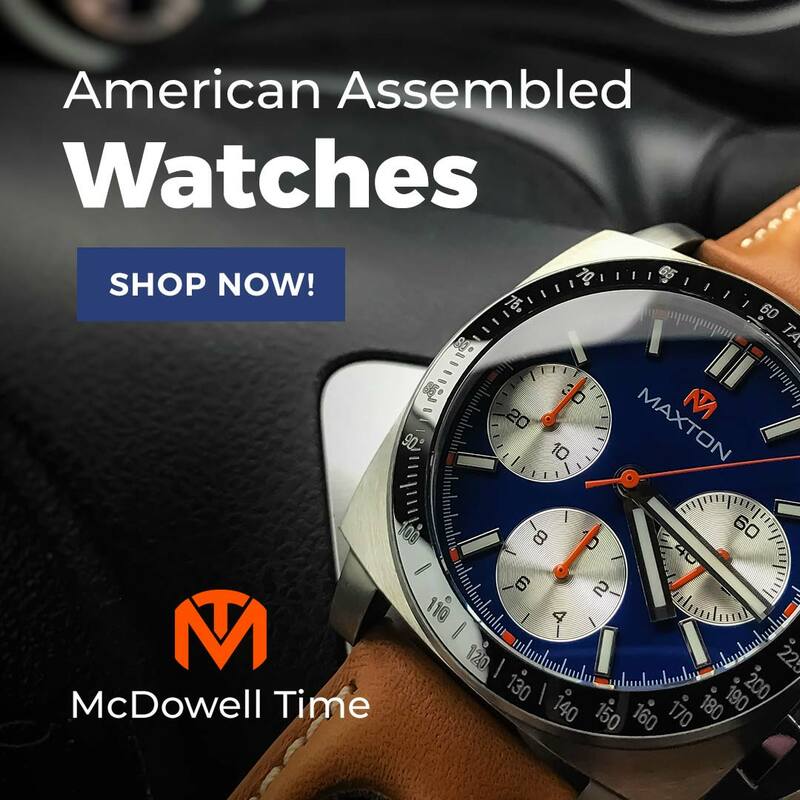 The dial is a brushed silver color with a blue index and large blue (11-6) and white (7-10) numbers printed on an orange horseshoe shape, shaded in blue and white as if it is rising from the dial. It's a bit much. I would have preferred a white background instead of the silver, and a more symmetrical design, but then again, I'm not 6 years old. I do like the handset though. The thick blue and orange pencil shapes are nicely proportioned and filled with white lume. They don't glow like a Seiko monster, but they will do the trick until bedtime. Water resistance is listed as 30 meters, which I would generally consider to be minimal, but the store clerks told us to clean it by running it through the washing machine. My wife and exchanged incredulous glances at this. And asked, "You mean just the strap, right?" We were cheerfully assured that there was no need to remove anything, just chuck the whole watch in with his laundry. I have no intention of doing any such thing, but the watch has survived several swimming trips without incident and that is good enough. Overall, Bum Jr. is quite pleased with his Swatch. 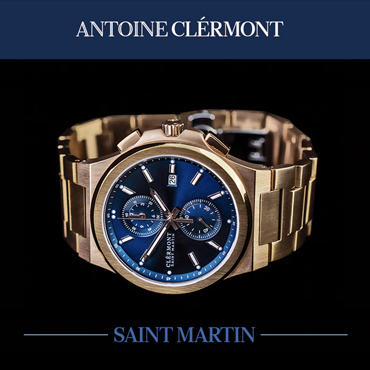 When I asked him to describe the best part of the watch, he dryly replied "Telling the time." I half expected a "duh, Dad" eye roll, but he was quite earnest. He is terribly proud of this fact and the watch is a physical manifestation of his new talent. 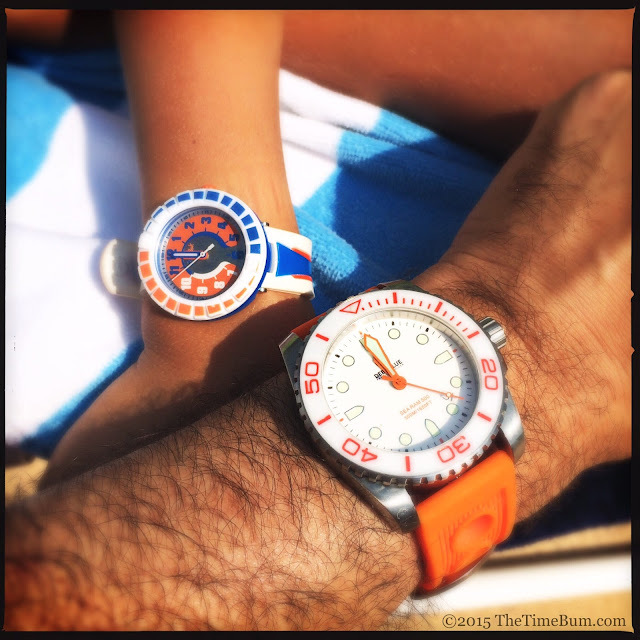 ("Dad, while you're writing about the watch, the time is 6:12"). He is particularly happy with its appearance. "I like the colors, the combination of orange and blue." He continued, "It kind of reminds me of one of your watches, the orange and white one that I couldn't wear that one because it was too big, but this one fits me." Pro: "I can tell time with it (it is now 6:28)." Con: "I sometimes had trouble getting it on in the morning. I used to need help getting it buckled because I couldn't get it tight enough without it slipping out and I also had trouble getting the white part [the keeper] down where I wanted it after I put it on, but now I can do it by myself every time." 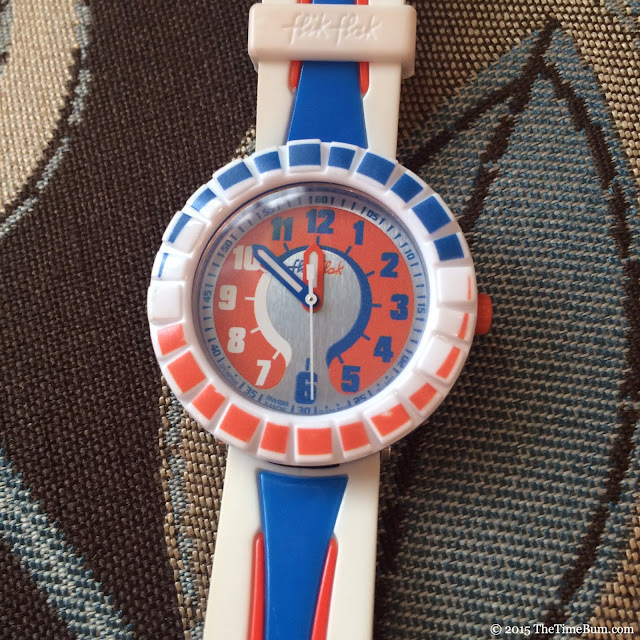 Sum: "Other kids would like this watch because it is a very cool watch. The Time Bum Jr. approves."